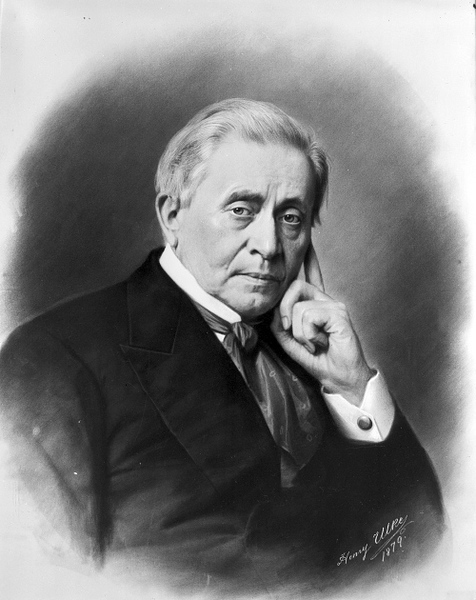 Joseph Henry, “Joseph Henry,” Histories of the National Mall, accessed April 23, 2019, http://mallhistory.org/items/show/349. Henry was a noted scientist in the United States when he was selected to serve as the first Secretary, or chief executive officer, of the new Smithsonian Institution in 1846. He served for 30 years, developing the new museum as a center for research, publications, and international exchange. During his tenure, the Smithsonian provided important support for scientists by coordinating and funding research, publishing original studies, and facilitating communication among scientists in the United States and abroad. He lived with his family in the Smithsonian Castle until his death in 1878. Joseph Henry's interest in science was piqued as a teenager when the popular Lectures on Experimental Philosophy, Astronomy, and Chemistry by George Gregory fell into his hands in 1808. Just over twenty years later, his career as a scholar began with a position as professor of mathematics and natural philosophy at the Albany Academy. Moving to the College of New Jersey (now Princeton University), Henry's work as a lecturer, researcher, and writer on an array of subjects from electromagnetism and astrophysics to molecular forcesbuilt his reputation as a pre-eminent scientific scholar. Travels abroad cemented a commitment to advancing American science. In 1846, Henry was elected the first Secretary of the Smithsonian Insitution by recieving a majority of the votes of the Smithsonian Board of Regents. He held the position of Secretary until 1878, and shaped the early contours of the institution. Henry's scholarly activities were practical as well as theoretical. Committed to basic research, he applied that research to improving the nation's capital and to advancing the application of science to current events. Henry strongly advocated the improvement and eventual closing of the unsanitary Washington Canal that ran through the National Mall. During the Civil War, for example, he supported scientific experiments to develop a balloon corps, develop new models of ships and weapons, and collecting ethnographic data from wounded soldiers. He was a driving force in the establishment of the National Academy of Sciences and he served as its president during the 1870s. Henry's advocacy for scientific advancement and his leadership within the national and international scientific community helped professionalize American science and solidify an American presence in global scientific endeavors.